Face the machine, place feet on rest(s), bend the torso forward (keeping the back straight throughout the entire movement), and bend the legs at the knees so that the attachment can be reached. Grasp the cable attachment, press with the legs until they are just short of being straightened (remember to keep the back straight). This is the starting position. The legs will not bend again until the set is complete and the weight is being set down. Sitting almost completely upright (you may lean backwards slightly if desired), inhale, pull the weight until the handle(s) reaches the sternum (the upper abdomen), and pause briefly. Lower the weight the starting position, exhaling throughout the motion. Once done with the set, bend the knees and lower the weight until tension is released from the cable, and then release the handle. Sloppiness in form is a common occurrence with seated rows. Do not fall victim to bad form. 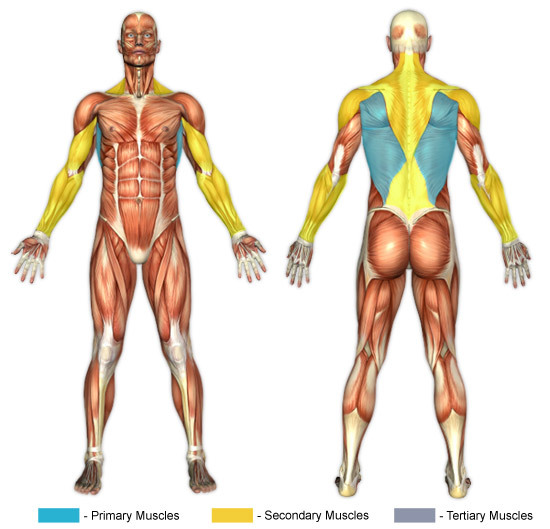 The point of the exercise is to intensely work the breadth of the back, not to lift the most weight possible. Heaving the weight back and forth, using one's entire body, is not the manner in which this sort of row is meant to be done. Instead, once the starting position is assumed, there should be very little movement of the torso. The elbows should move forward and backward, not the torso. When attempting heavy weight some torso movement is to be expected, but it should never be wild, jerky, or uncontrolled; it should be moderate - just enough to keep a nice, controlled power rhythm. Generally, seated rows are not considered part of the lower back exercises category; they are great for hitting the lower lats. Keep this in mind, so that focus stays where it belongs - on the lats and traps. It's when the chest is raised that the lower back (spinal erectors) become involved in the lift. Note that it is at the end of the flexion portion of the movement (when the shoulder blades come together) that the trapezius and rhomboids really come in to play. If you desire for these muscles to be worked effectively with this exercise, then be sure to consciously squeeze and hold the shoulder blades together at the end of the flexion portion of the movement (the handle will be near or at the sternum of the chest at this point). Do not round the back when performing seated rows. Keep your back straight throughout the movement.